This year’s annual commission meeting will take place connected to the European Planetary Science Congress event in Berlin, Germany. Date: Wednesday, September 19, 2018. Place: Meeting point: in front of the TU Berlin building (Hauptgebäude der Technischen Universität Berlin, Str. des 17. Juni 135, 10623 Berlin, Deutschland. (G87G+2Q Berlin, Deutschland). We will move to a meeting room from here. If you are interested in participating, please come to the meeting point at 0945 or write to hhargitai@gmail.com for more information. Commisson members and non-members are all welcome. Topics: Past, present and future projects of the commission; new commission members, new chair selection process, suggestions for new projects. The meeting had 12+1 participants. The sessions included 7 planetary talks (plus two in the pre-conference workshop) and 4 posters. We discussed the commission projects, including the children’s maps, EPO apps and projects, nomenclature issues and databases. It was stated that the basic goal of the commission is not to resolve science questions but to facilitate visibility of planetary datasets for the terrestrial cartographers and produce EPO materials for students. M. Pitura volunteered to further develop the commission’s WordPress website. We agreed that the commission website will feature a “toolbox” for planetary EPO that will include the tools we presented during the meeting, including the desciption of enhanced ePub, game/city engine etc. A. Nass talked about the need for a publication that helps mappers in planetary feature identification in images. A. Jasper talked about the problems of nested placenames, and designation of subsurface features identified on radar data. For the childrens maps, we talked about the need of better targeting age groups and defining the exact ways the map wants to engage readers and how the map could relate to the reader’s experience. We agreed that a planetary map reading test will be made to find the best ways to depict an extraterrestrial surface that is understood by the readers. Placenames are important on a planetary map because they may be the only parts of the map that is relatable, i.e. has some familiarity to the map reader. In future publications we will experiment with maps designed in familiar scales, i.e. city map, country map, continent map scales – increasing relatability. We have discussed the possibilities of coordinated activities between our commission and the IAU Commission on Cartographic Coordinates & Rotational Elements. – triggered by a talk by J. Reyes, we could develop a Mars Atlas based on the design of the School atlases of M. Kogutowicz. There is no decision on next year’s meeting but it could be in Central Europe. We have agreed that in Tokyo, a new chair has to be appointed. Comments, ideas, projects from You? Send it to hhargitai @ gmail.com. 5707.1 – Nyrtsov / Savric / Conic projections of the triaxial ellipsoid: The projections for regional mapping of celestial bodies. We visited the Air and Space Museum with the guidance of Jim Zimbelman. ICC2017 — July 1, Washington, D.C.
Joint workshop to share the results of latest and most representative research. Deadline for the submission of full papers: March 30. The perfect gift for your young scientist? The new children’s map of PLUTO and CHARON. The map will premiere on December 13 at the AGU meeting in San Francisco and will be available for download from the next day. In the USA, we ship it to your home before the holidays. Downloads of the full resolution map will be free before the holidays. How do you chose your summer travel destination? Checking websites, asking friends? And how do you navigate there? Using road signs? Online maps on your smartphone? Offline maps on smartphone? Paper maps? GSP turned on? Trusting your instincts? OK now how would you do this on Mars if you were a Mars Astronaut? The mission: explore an area 100 km in radius (the size of Maryland or Belgium). What’s worth studying? How do you get there? What if you lose power? What landmarks will you have? With no roads, no vegetation, but lots of craters, rocks and dust, you will need a good map designed for planning and navigating – a map that can save your life. And you want to avoid a situation like that, just seconds before landing, as it happened during the Apollo 11 mission. Apollo astronauts had a “cuff checklist” booklet (see image above). 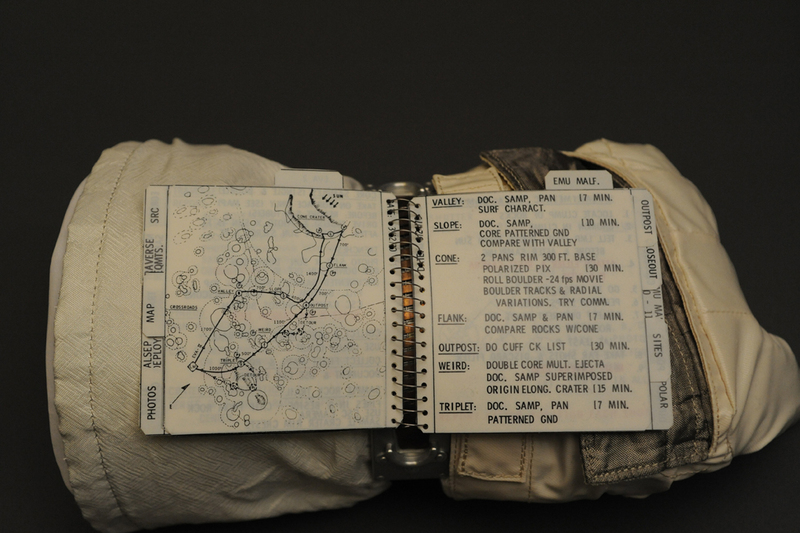 Apollo 13 traverse map from cuff checklist. No battery, GPS or wifi were needed to operate it. On Mars, it will probably be different. We asked students, GIS professionals and citizen scientists to design a map, or map elements that could be useful for the astronauts who will use them in… well, at least 25 years from now. Mateusz Pitura showed Mars in golden ochre colors. The Hebrus Valles habitat is next to the rampart flow front of a crater ejecta. The author evaluated all routes according to their difficulties. It is a hiking map on Mars. Easy – < 15 km long. No special preparations required. Possibility of surface dust and small craters. Slopes under 10 degrees. Medium – 15 -30 km. Rocks, rock rubble, small craters, surface dust, troughs and slope above 10 degrees. Hard – >30 km. Hazards inlcude steep slopes, >30 cm rocks which could be an obstacle for rovers, big rock formations, craters, surface dust, troughs, ice and depressions. Jonathan Ocon mapped Acheron Fossae. Usually we use some hand-held device to view maps, but on Mars, you are already within a device, the space suit. 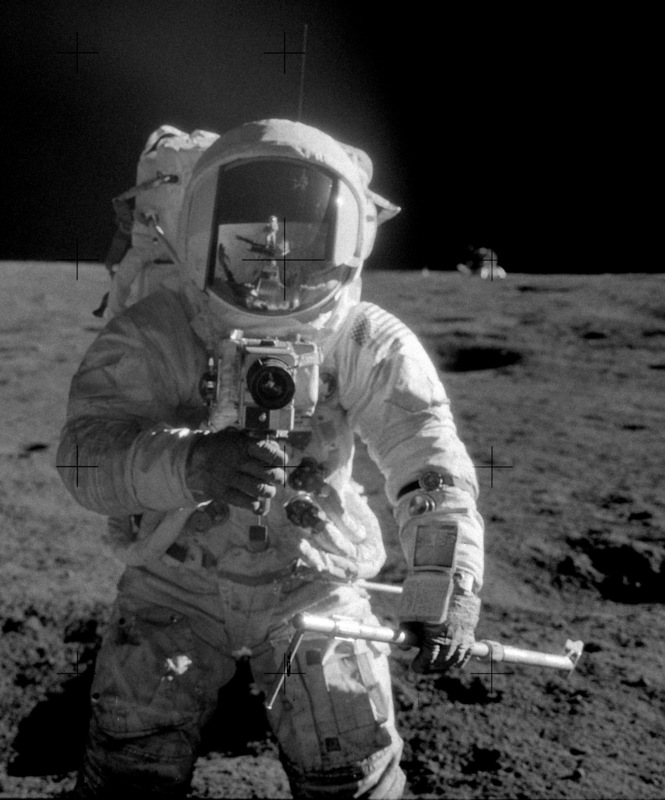 So instead of a paper checklist fixed on your arm, as they did on the Moon, we could use augmented and virtual reality technology and project geospatial information onto the visor used as a screen. In this view, it displays all data about nearby potential targets, date, time, and overview map. 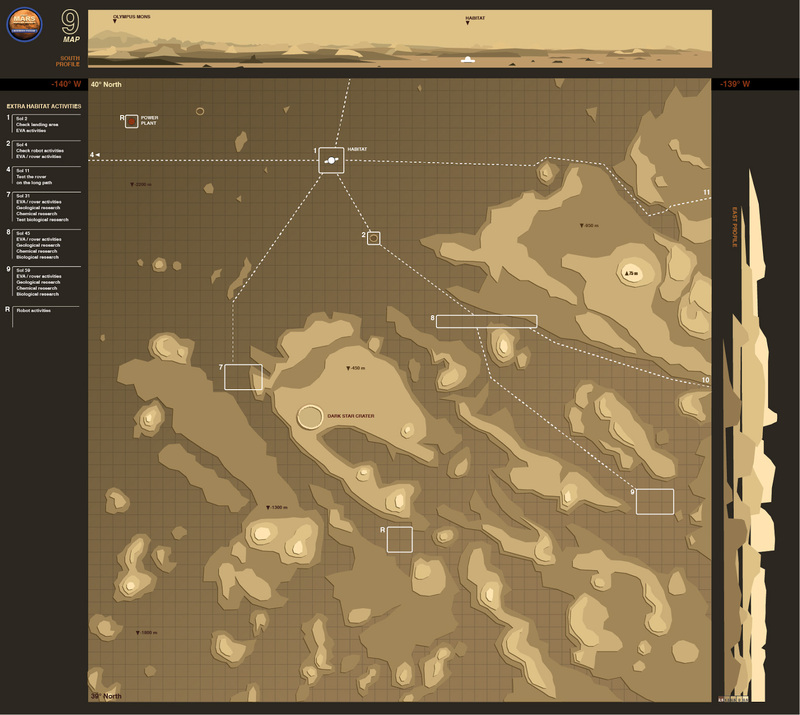 This map by Eian Ray shows Eastern Valles Marineris. The map contains contour lines, points of interests and distances from the hab that could be the most important data to know when you leave the hab and want to return in time. The map also contains fictional names: ” Not only will this encourage mental and emotional continuity by exposing the mission participants to names of places they are already familiar with, but it will help foster a sense of place as the astronauts begin to develop a geospatial awareness of their new Martian home. … It softens the difficulties faced by those who’ve settled in a new land, while drawing new explorers to an unfamiliar land with visions of familiar sights and sounds, real or imagined” – Ray says. Camillo Battistioli mapped Acheron Fossae. These maps don’t want to achieve photorealistic representation, instead, it shows the surface in a simplified way: contour lines become elevation slices, shades of brows show height and a grid helps our sense of distance. The pathways are clear and simple, and a perspective view helps familiarize with the target area at a single glance. This happens when cartography, science and art meets. 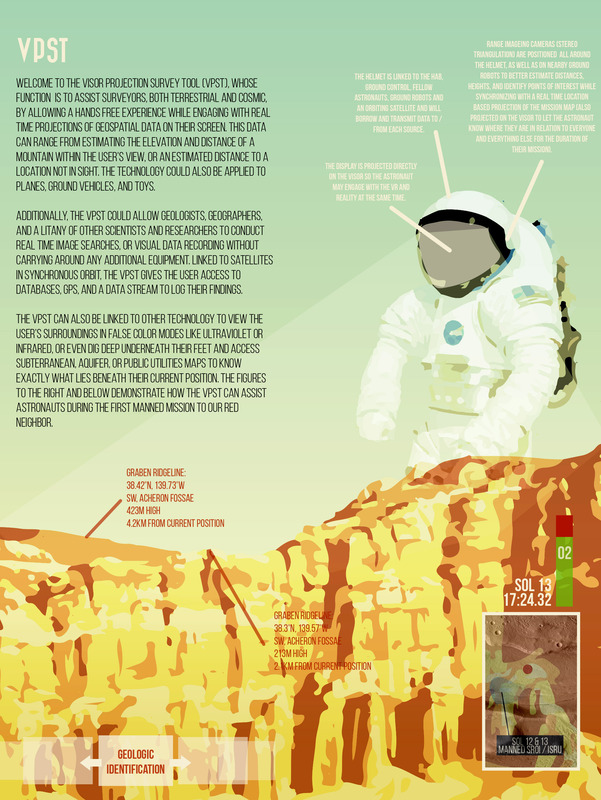 Map data are just one of the many things Astronauts should know here and now. 3D spatial data, live streams of weather conditions – dust storms, approaching dust devils, potential or existing fog or CO2 frost -, health data can hugely affect the mission. It is also good to see what other astronauts – and robots – are doing. Astronauts likely won’t need to download apps from an appstore: they will have all in one. JJ Moran‘s app made with the Unity game engine shows a preview of what this app will look like. “After conceptualizing several possibilities it was decided that from an astronaut’s perspective, it would be best if the map product could be integrated with an existing GUI. This GUI could hypothetically be a single interface the astronauts could use for communications, mission updates, and map data.” – JJ says. We are proud to present the Map of Libraries on Mars. 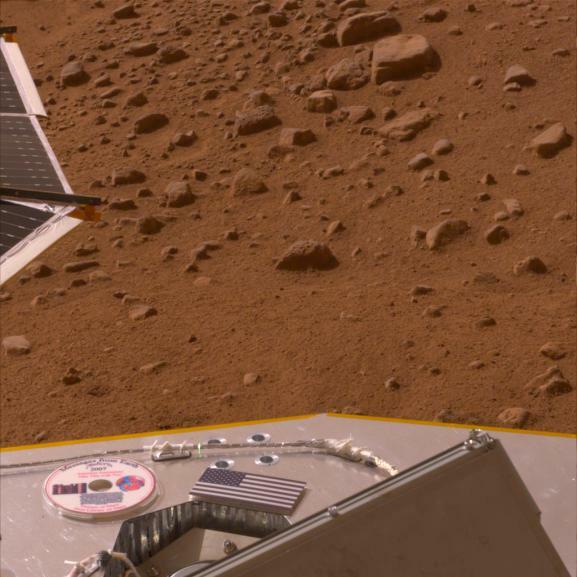 If you happen to land on Mars and feel bored, perhaps terribly bored, and lonely, too – no worries! Just go and find the Phoenix Lander equipped with the First Library on Mars. This unique facility offers books, and its multimedia collection includes radio broadcasts, artworks, and greetings from prominent space scientists. The full catalog of the library is below. Attention, astronauts! Please, return the borrowed items within 2 weeks. Multimedia items cannot be renewed, sorry. 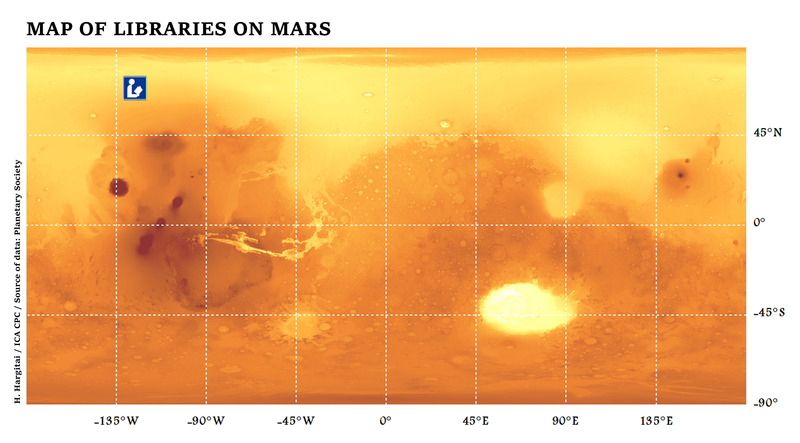 For a high resolution Map of Libraries of Mars, click here. Ah, yes. We had some budget cuts so you have to bring your own DVD-ROM player. Sorry about the inconvenience this may cause. Handle with care! Hand by author. DVD by Planetary Society. The Catalog of the First Library on Mars. Mitsuse Ryu The Sunset, 2217 A.D.
Congratulations to all the Mars mappers from three continents!